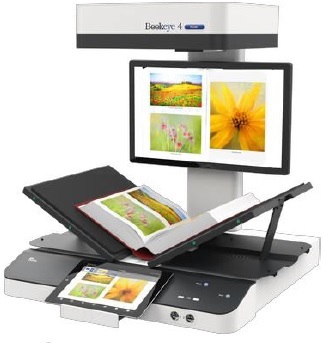 Designed specifically for self-service book scanning, scan originals up to A1+, such as books, newspapers, magazines, posters, folders or bound documents of all kinds can be digitized. Integrated V-cradle can be locked at a 120 degree angle. 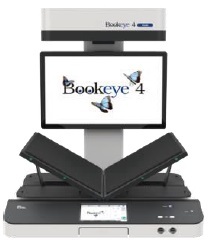 Scan books lying flat or in the protective V-cradle position. The V-shaped book cradle reduces the risk of damage to the spine and binding. 24 bit color, grayscale, bitonal at 600 dpi. 64bit Linux based computer, fast and virus protected with easy integration into existing networks. Scans directly to SMB, FTP, hot folders, USB, Email or the Cloud without external PCs.